Cataract Scout Park, Australia, 1987. 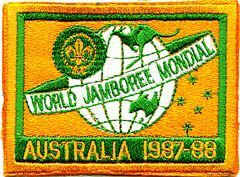 A specially constructed Scout tent town situated on a 160 hectare site near Sydney, this was the first Scout Jamboree to be held in the southern hemisphere. Under the theme "Bringing the World Together", 16,000 Scouts from over 80 countries attend the Jamboree, with around 13000 more in attendance on visiting day. The first time members of the Guide Association have been allowed to take part in a World Scout Jamboree. Some participans: Mrs. Betty Clay, daughter of the Founder, and 11 members of the B-P family, 9 whom are direct descendants of B-P. The opening ceremony, which took place at midnight on December 31, 1987, was the first official event of Australia`s Bicentennial celebrations. ( the information for the 16th and 17th Jamborees was taken from "Jamborees of the Past",Scoutnet UK).